Here, Robaina learned the secrets of the land where he set up his own vega, or tobacco fields. For quite a while now, his 16-hectare vega, located in Cuchillas de Barbacoa, has produced the best wrapper leaves in the region, enough to wrap an average amount of eight million Habanos per year. Quite a record considering that the total production of Premium Habanos in Cuba is approx 150 million per year, depending on weather conditions and harvest ups and downs. He rubbed shoulders with Nobel prize-winners and famous musicians. Sting asked him for his autograph. Although this last single piece of information makes it very obvious that he was famous, it actually tells little of the only living Cuban tobacco grower who managed to have a brand of his own and six different Habano vitolas with his name burnt into the wood of cigar boxes, and who scientists, presidents and millionaires wanted to sit next to. He began to work the land with his father when he was nine, and at that time, when he didn’t even have a pair of shoes to wear, he had his first smoke. He only quit smoking shortly before he died. He would smoke four or five cigars daily, always hand-rolled by himself. He would frequently say that tobacco was a family thing. He knew each and every plant of his shade grown tobacco fields and each leaf in every plant, and every bug on each leaf. “You have to love the land and care for the plants like you care for a child. This is why this is a family crop,” he used to tell visitors, which included royalty, rock stars, ambassadors, Nobel prize-winners, movie stars, and many more. Fidel once tried to convince him to join a cooperative. “He wanted individual family-owned tobacco fields to become large tobacco plantations, or cooperatives, and me to become the president of one of them. But tobacco has to be family-grown. We discussed the matter for about 30 minutes. The last thing he said was, ‘Boy, what a stubborn little old man!’” he would recall during an interview in 2009. Robaina was an old-fashioned guajiro, but an innate scientist too. This is why he was always open to new advances and to experimenting with new types of seeds. He was naturally wise. 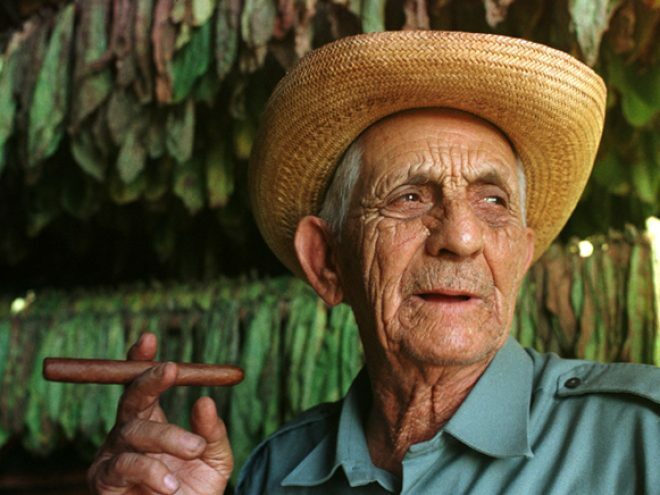 He would always say that the San Luis and San Juan y Martínez areas in the Vuelta Abajo region had the best soil in the world for growing tobacco, which is why the leaves there taste different and are matchless. As was the case with the incomparable musician Compay Segundo of Buenavista Social Club fame, celebrity would come a bit late in his life, but he enjoyed it to the full. In the latter years of his life, he travelled all over the world as ambassador to the Habano. He drank toasts with actors and monarchs. Once, in a social event in Spain, he was having a chat with King Juan Carlos when the musician Sting came to his table and asked him for his autograph. He also kept in his home newspaper clippings of interviews made by The New York Times. But for him, the important thing was defending his plants from mould and growing the best wrapper leaves in the world.